As a business owner and entrepreneur I am in charge of my own education and networking. I've been fortunate to have amazing mentors and teachers along the way through various workshops, retreats, and friendships. Last year two fabulous photographers Elena S Blair and Sandra Coan started an online business course called Ladyboss Workshops with a goal to share what they have learned as creative entrepreneurs, so that others can build the business they love and a life they deserve! Joining the course and engaging with their online community has helped my business in so many ways. One of those was connecting with the beautiful Hooks family! Megan is an fiercely talented photographer in the Seattle area. 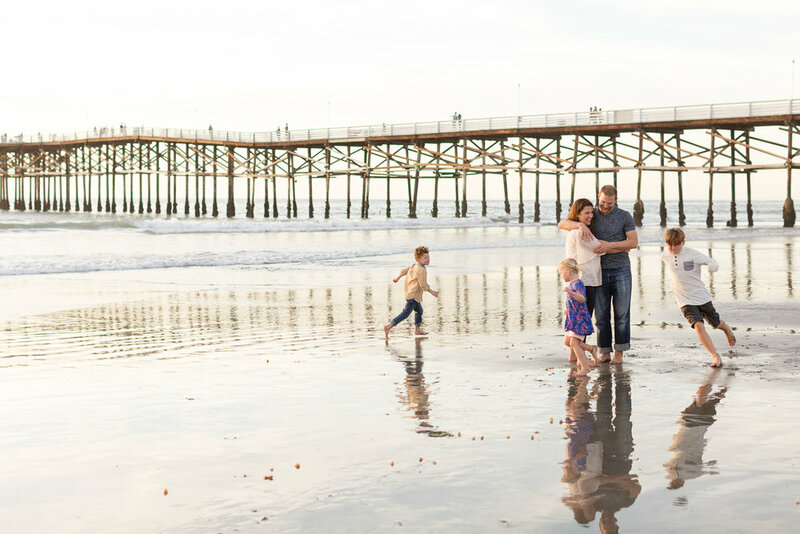 After connecting on social media she asked me to photograph her family while they vacationed in my home town, San Diego. I jumped at the chance and we had a so much fun romping around Pacific Beach's Crystal Pier. I loved every second I got to spend with this this gorgeous group. I only wish we had more time to grab a drink and continue chatting face-to-face. I'm going to have to make plans for a family trip of my own to Seattle so I can ask Megan to photograph my wild crew. Her work takes my breath away! Are you vacationing to San Diego? Click here to book your family photography session! Are you a fellow entrepreneur? Click the button below to learn more about Ladyboss Workshops!